Employees: Have you been wrongfully terminated or discriminated against by your employer? Have you been subjected to unwanted harassment or retaliation? Have you been denied FMLA leave or not paid for overtime work? Perhaps you need representation at an unemployment hearing or require counsel to review a non-compete or severance agreement. Maybe your employer breached your employment contract. If you need any of these services, simply click on the corresponding page to the left and complete the attached form. I will then review and contact you for a FREE CONSULTATION. Employers: Have you just been served notice that one of your current or former employees is suing? Do you need representation at an unemployment hearing? Perhaps you require assistance in drafting OR updating an employee handbook. Regardless of your employment needs, I can help. Simply call me at 614.477.7301 for a FREE CONSULTATION. I have been representing employees and employers in a variety of employment matters since 2001. In doing so, I have gained invaluable experience and perspective from both sides of the table. Just as a former criminal prosecutor can adapt and apply his knowledge of the "the criminal judicial system" into a successful defense practice, I can assist employees and employers alike because I understand the issues, costs, and myriad of other matters inherent for both parties in employment litigation. 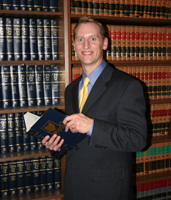 © 2009 Dawicke Law, Jason E. Dawicke, Attorney at Law. All rights reserved.